Installing drywall may sound like a straightforward concept that provides aesthetic value for a structure, but today, modern gypsum products are being tailored to meet a wide range of needs. In the hospital setting, drywall installation can become much more intensive, meeting rigorous demands to create the best atmosphere for patient health and recovery. Proper building designs will also help to minimize distractions for physicians, create comfort through quality, and enhance the success of healthcare services. If you’re in need of experienced drywall contractors in Chicago that excel across a wide range of services, our commercial drywall company can help! AZ Drywall Finishing is here to deliver quality results to clients of all sizes across Illinois. We understand the differing complexities and demands of different buildings to suite unique services for a variety of establishments. 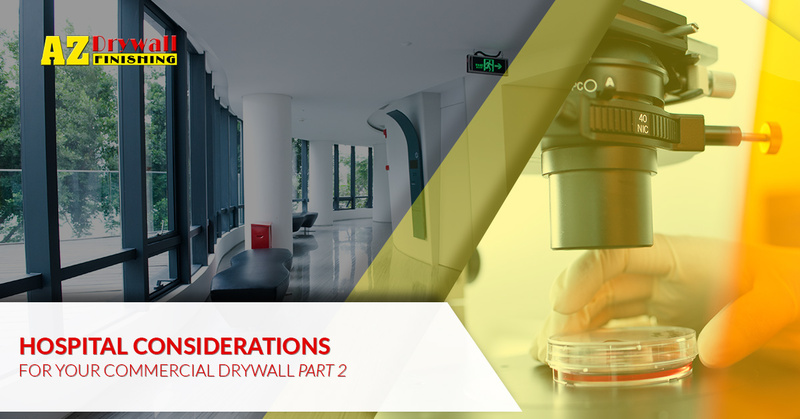 Today, we’ll continue to discuss a few top factors to consider when planning on drywall installation services in a hospital setting. If you’re planning on a new structure, renovation, or addition, be sure to reach out to the AZ team for help! Safety concerns are a top priority in medical facilities, as patients with compromised immune systems and mobilities are especially at risk in the event of an emergency. Concerns such as tornadoes, floods, and even active shooters make it essential to focus on human safety above other priorities. Our commercial drywall team can help you to find the best solutions for your building, relying on fire-resistant gypsum that can create an effective escape route for patients and staff. Fire safety in medical settings is accomplished through strict code adherence. Proper coverage can more than double the safe escape time if a fire were to break out. If your building requires fire-safe drywall installation, be sure to talk to our team to find the most durable and cost-effective solutions for your needs. The human element of hospitals and medical offices cannot be valued enough, but the aesthetics of your structure can go a long way in communicating to patients how dedicated you are to professionalism. Clean, quality interiors can help to put patients at ease. Where you work is a representation of your services, making it essential to install drywall that is built to withstand a wide range of damages. From medical carts to hospital beds, the amount of traffic going through your facility creates the strong need for products that can stand up to the abuse. Not only will investing in the right product benefit your operations, but it will also help to save money and time in terms of future repairs! The aesthetics of your hospital design can also help to reduce patient anxiety. Classic designs feature durable, blank walls that feel more cold and calculated than anything else. Guests often feel more at ease in visually beautiful spaces, offering upscale fixtures and eye-catching paint colors to create comfort over autonomy. Quality drywall installation and design services can make all the difference in creating quality both aesthetically and in terms of protection. Part of the commitment to your community is giving back and making a positive change whenever possible. Every component involved in your building’s construction will have an expected life cycle and rate of recyclability. Our modern focus on eco-friendly practices makes it essential to plan properly for the scope of your building’s waste, both now and when renovations or updates are needed. Based on your needs, we can source environmentally conscious and sustainable drywall to create a quality outcome. The health of your patients depends on a healthy environment, so be sure to protect the world around us as well as the people inhabiting it. Your medical building is more than just a structure that houses healthful services, it is also a major part of the recovery process for all patients. Providing care for your community is essential, making it important to find drywall contractors with the experience and equipment needed to provide quality outcomes. We will work hard to complete your project on time and on budget while achieving the best results for long-term benefits for both patients and staff. Contact us today to see how our drywall contractors in Chicago can outfit your business with quality!